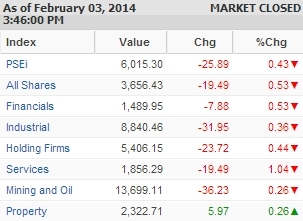 Manila—(PHStocks)—Philippine stocks extended their declines Monday, 3 February, on news of lower China PMI. Other markets in Asia, meanwhile, remained close in celebration of the Lunar New Year. The benchmark Philippine Stock Exchange index (PSEi) dropped by as much as 51 points early in the session, before cutting the losses to just 25.89 points or 0.43%, maintaining its foothold above the 6,000 level. Only the Property sector gained, albeit minimally (+0.26%). All remaining counters were in the red, led by the Services sector, which lost 1.04%. Meanwhile, both the Financials and the wider All Shares dropped by 0.53%. Value turnover reached PhP5.6 billion on 791 million shares traded. There were 50 gainers against 99 losers, while 50 stocks were flat.